A gift basket is a great present for any gardener in your life, and is easy to customize to any gardening preferences. 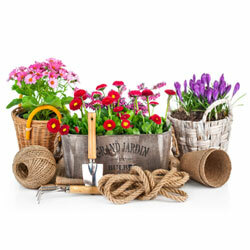 With just one trip to the garden center, you can create the perfect gardening gift basket for any special occasion. A gift basket can be a wonderful choice for any special occasion, including birthdays, anniversaries or holidays. A gardening gift basket is especially thoughtful for someone who is interested in starting gardening as a new hobby, perhaps after retirement or buying a new home where they finally have gardening space. Anyone starting a clean eating or clean living lifestyle may also appreciate getting started gardening so they can better control their own food sources. A wicker or woven basket is the traditional choice for building a gift basket, but when you’re making a gardening basket, you can think of more creative containers instead. 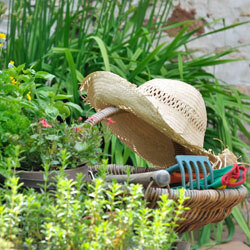 For a small basket, consider using a galvanized bucket, watering can, bird bath, window box or other creative option. Larger gift baskets can start with a large planting pot or similar container, or even something as practical as a wheelbarrow. Filling the bottom of a basket provides a sturdy base to support gifts, as well as to be sure the basket does not tip over when it is filled. For a gardening gift basket, good options for a firm base include a bag of potting soil or fertilizer, mulch, peat moss or other gardening goodies. A bag of birdseed or river rock can also be an exceptional base. Even a large hose can help fill the bottom of a container and will be another great gift. The bulk of the basket should be the different gifts that match the recipient’s gardening dreams. 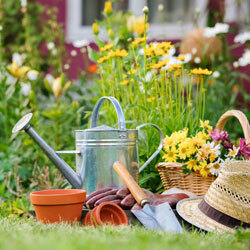 For a flower gardener, for example, that may include bulbs and seedlings of their favorite blooms, as well as flower pruning shears and other hand tools. A vegetable garden gift basket, on the other hand, would have different veggie seedlings, plant identifiers and perhaps some long-handled tools for working in the garden. A bee house can be a great addition for any type of garden to encourage more pollinators, and a garden hat, new gloves and how-to books are all good choices for any gardening-themed gift basket. Of course, a gift card will always make a perfect addition to any gift basket allowing the recipient to make a few choices of their own. To make a gift basket extra special, be sure to add some luxuriously decadent gifts. These might be purely decorative items or artisanal extras, and can really add character and thoughtfulness to your gift basket. Wind chimes, welcome flags and gnomes or other whimsical pieces are great options, or choose items such as candles, soap, lotion bars, honey or other treats available from local artisans. A good gift basket will be lush and full of fun gifts, and you can easily fill in small bare spots in a gardening gift basket with a range of smaller, inexpensive gifts. Packets of seeds, vine ties, plant food, pot casters, or even a hose nozzle are just a few fun options that can really fill out a gardening gift basket. For colorful fillers, consider adding potted flowers or floral starts for blooms to serve as bows. Once your basket is filled, it’s time to make it look more like a celebratory gift. Choose a card to include as a greeting, and wrap the lip of the basket with ribbon, twine or raffia to draw the gift together. Smaller baskets may even be entirely wrapped with cellophane or tissue so they can be opened for a fun surprise. Burlap can be another option for a rustic but still practical covering or wrap that can be used in the garden to cover delicate plants after the gift is opened. A gardening gift basket can be an amazing way to celebrate any special occasion or friendship. By choosing gifts carefully and coordinating the basket to the recipient’s gardening wishes, the gift is sure to be a wonderful surprise that is happily appreciated every time the recipient steps into their garden.